Tyas Ayu Lestari. Born in Bandung at 17 June 1988. Bachelor degree at Biochemistry Department in Bogor Agricultural University (2006-2010). Tyas worked at Wetlands International Indonesia (WII) as social economy specialist in Partners for Resillience (PFR) project for 2 years. Tyas continuing master degree program in IPB (2013-2016) at Natural Resources and Environmental Management (PSL) Depertment. In 2016, Tyas take the topic of research on estimation of carbon storage in the mangrove ecosystem and issued several publications, both national and international. During the master degree program, Tyas was once the auditor book written by the Geospatial Information Agency (BIG) and WII related mangrove mapping in Sumatra. 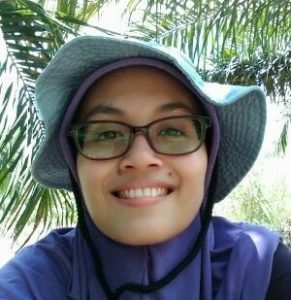 Recently (2011-2016), Tyas very interested and active in studies on mangrove management, climate change, carbon, and disaster. After graduate, Tyas back to work in the WII as Lowlands Ecosystem Disaster Risk Assessor (Ledra) in the project Partners for Resilience Strategic Partnership (PFR-SP) and assisst RemarkAsia in the study of Carbon Stock Analysis (CSA).